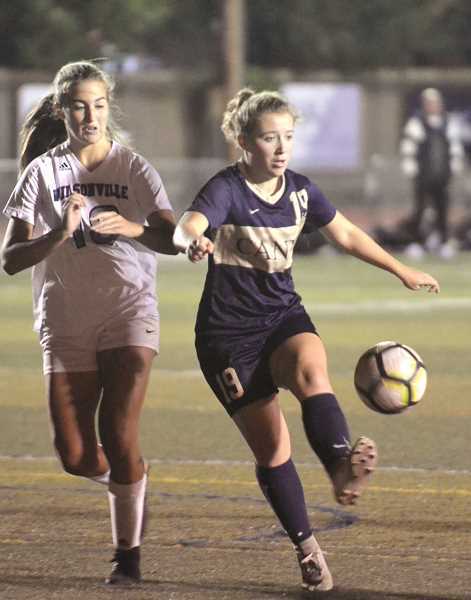 CANBY — Despite the disparity of the records on paper, there was a battle at Cougar Stadium between two top notch girls' soccer teams. Canby came into the matchup with Wilsonville 5-0 with 37 goals in its favor. The Wildcats meanwhile had picked up their first win against Crescent Valley earlier in the week to improve to 1-5 in the preseason. For 80 minutes the two teams battled back and forth, and Wilsonville showed off a potent offensive attack but was unable to put the ball in the net enough to overcome the opportunistic Canby strikers. At the end of the game, Canby had bested the Wildcats 6-2 on Thursday, Sept. 20 to remain unbeaten. 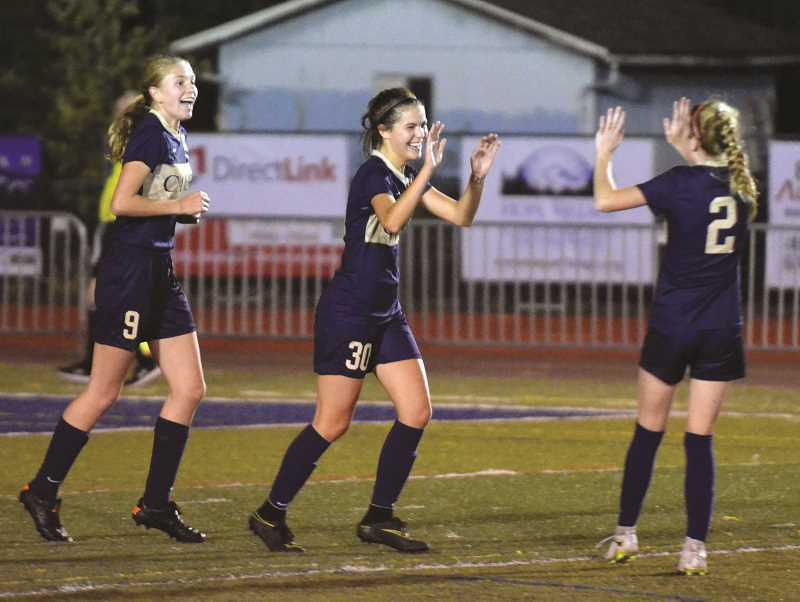 "The girls relied on what we've been working on all season, whether it's the fundamentals of our defensive shape or the shape we get into when we attack," Canby head coach Maria VanAcker said. "Wilsonville put us under a lot more pressure than we'd faced this season, so big shout out to those guys. What the girls did was adjust quickly. We got numbers behind the ball, we defended as a unit. Then we looked to our outlets once we regained possession." The Cougars got up on the board quickly with two goals, but not before Wilsonville took several shots on goal within the first 10 minutes. 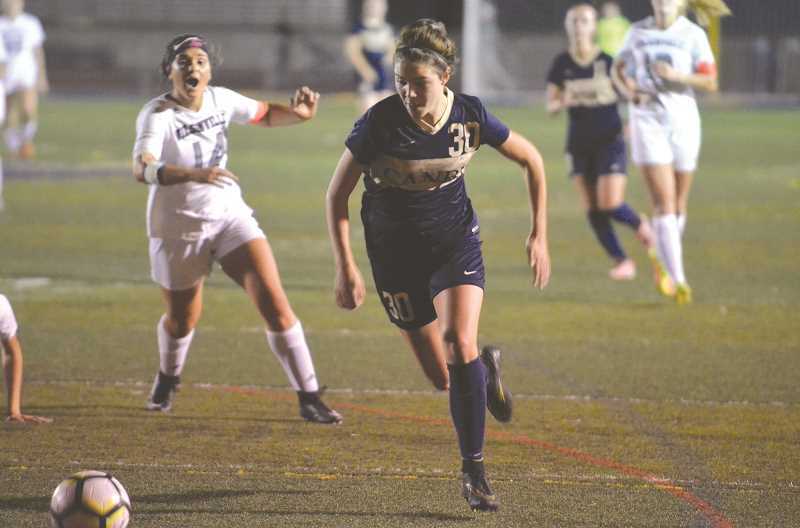 Freshman striker Lindsey Antonson and senior Teagan McNamee were two of the players who assailed the Canby backline. It was in the 29th minute though when the Cougars flipped the script. Senior Madison Miller got the first goal of the night at 28:06 of the first half, and was up against the Wildcats. Less than three minutes later, Canby scored again after repulsing several Wilsonville attacks at the 25:36 mark of the half. Canby was up 2-0. Wilsonville stayed as aggressive as ever, and it paid off shortly thereafter. Antonson crossed the ball in to McNamee who shot the ball into left-hand side of the net to make the game 2-1. The two teams battled back and forth in the rest of the first half. Canby got another goal back on the Wildcats, scoring thanks to freshman Makena Speer who maneuvered through traffic to find the net at 11:50 of the half. Wilsonville answered back with a goal less than a minute later, this time Antonson getting a goal of her own. She shot the ball over Canby goalkeeper Halle Adair, who just managed to touch it with the tips of her fingers before it passed over her into the net. It was 3-2, and the half ended with Wilsonville attacking the Canby net. The second half saw some more of the same from Wilsonville aggressively, but the outcome was less fruitful. The Canby backline and keeper Adair were able to do enough to keep the Wildcats from gaining another goal. The home team meanwhile was able to break into Wilsonville turf, and got goals on three separate occasions. Senior Claire Wright got goal number four at 33:22 of the second half, chipping the ball over Wilsonville's keeper Kendall Taylor. The next goal came with 11:01 to go in the game with freshman Joeylynn Baguio, who beat two defenders to find the goal. The final goal came from sophomore Ellie Shorter at 2:25 to make the goal 6-2. "When we're attacking, I just feel like everyone is clicking," Wright said. "We clicked last year, but I feel like the chemistry is different this year. That doesn't mean that it was bad last year, but I definitely feel that when I'm in with the certain girls that are up top with me, I feel like we just click and score goals. It's awesome." Wilsonville made a contest of it though, attacking the Canby backline and goal. Juniors Araxi Tejeda-Martinez and Kylie Aube joined McNamee and Antonson in attacking the goal. The closest Wilsonville came to finding the back of the net in the second half was Antonson taking a shot at 24:10 of the half that bounced off of the crossbar. Still, the Canby defense held strong, keeping the Wildcats off the scoreboard in the second half. "I think the second half we had a lot more composure," Adair said. "As long as we stayed in front of them, didn't let them get a shot off, nothing bad was going to happen. They were calm, collected." Canby (6-0) moves on to face Barlow (5-0-1) on Tuesday, Sept. 25 after the Herald goes to press. Wilsonville (1-6) will return to its home field to face 6A Forest Grove (0-6-1). Against the Bruins, Canby will look to do the same things that have brought it success so far. "We're going to have the same game plan that we've had all season which is to play our game," VanAcker said. "Again, we like to control the pace. Sometimes we slow it down, sometimes we turn it up. What we're going to look to do is compete for the entire 80 minutes, and look to use different methods of attack and hone in on our defensive shape."